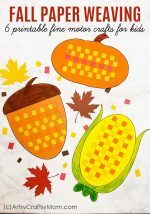 Bring alive the colors of fall in this super simple DIY Autumn Tree Pop Up Card that even young kids can make, with a little help from Mom and Dad! One of the most iconic images of autumn is most certainly one with fall trees, dotted with leaves in yellow, orange and various shades of brown. Don’t know about you, but just looking at an image like that makes me feel a slight chill in the air and I can almost smell pie! That’s the thing about images and associations – they can stimulate all your senses! Autumn, for instance, is associated with pumpkins, pie, pinecones, falling leaves and of course, trees in all their autumnal glory! 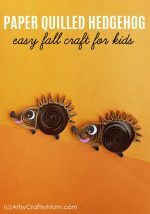 We’ve already got a fall themed quilling tree craft, but if you’d like something easier for the little kids, here is a super simple autumn tree pop up card. 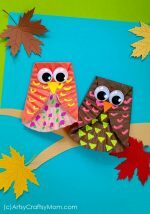 All you need is some colored craft paper and basic craft supplies; and with a little help from Mom, Dad or an older sibling, even newbie little crafters can make this! 1. 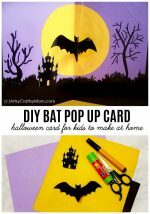 Fold Blue craft paper in half to make a card. Cut the Beige paper in half and stick it on the inside of the bottom half of the blue card, so it creates a base for the pop up. 2. Now fold the card again. Mark three 1/2″ wide slots along the fold, and cut as shown. These will hold up the trees. 5. Our base is set, now it’s time to make the trees! 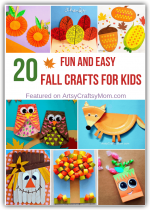 Cut out oval and round shapes from the craft paper sheets in fall colors – red, orange and yellow. They don’t have to be perfectly symmetrical! 6. Fill in the empty circles and ovals by drawing in some quirky branches using a black fine tip marker. 7. Time to assemble our pop up card! Open up the card and stick the bigger trees directly on the blue surface. The smaller trees need to be glued on to the popup strips we made in step 3. 8. For the final touch, fold the card and stick another blue sheet on the outer side to hide the popup folds. This also helps to make your card a little sturdier. To complete the card, I added a paper cutout – Thanks. You could also add Thankful. I also punched some fall colored papers to add the illusion of fallen leaves..
That’s it – your super simple Autumn Pop Up Card is done!! We love making pop up cards – they add such a nice element of surprise when the card is opened! And they’re a lot easier to make than they appear, you don’t even need any fancy supplies! Most of this project can be done by young kids themselves – the pop-up slots may need some adult supervision. 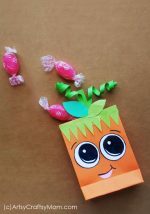 Once you make this DIY autumn pop up card, I’m pretty sure you’ll be tempted to try many other ideas too!